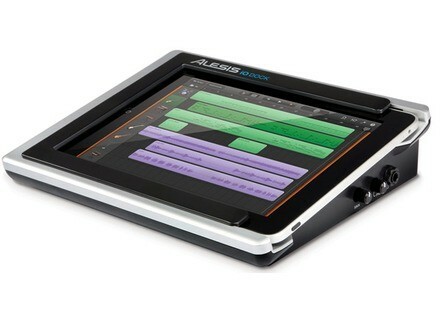 iO Dock, Audio or MIDI interface for tablet/iDevice from Alesis in the iO series. Product replaced by the Alesis iO Dock II. 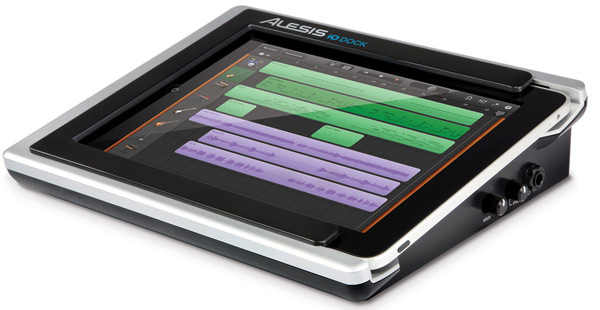 Alesis has announced that the iO Dock, a dock for Apple’s iPad and iPad 2, is now shipping to pro-audio and instrument retailers. The iO Dock is described as "the missing link between the iPad, its associated App Store’s catalog of audio and video apps, and the world of professional audio equipment." With the iO Dock and an iPad or iPad 2, musicians and producers can record, perform, create and craft music in various manners or locations. Built to accommodate current app-development standards including Core MIDI and Akai Pro’s AkaiConnect SDK, the iO Dock is designed as a universal iPad audio-recording, playback, and MIDI device that bridges the user’s choice of music-creation and performance apps with professional input and output instruments and devices. The iO Dock provides microphone and instrument users with two combination XLR and 1/4-inch inputs, each with its own gain control and switchable phantom power for condenser microphones. Guitarists will use the iO Dock’s guitar-direct switch, enabling them to play, perform and record into amplifier and effects-modeling apps. Bands can connect outputs from their mixer to record their performances and rehearsals or use the iO Dock as a metronome or loop-playback device on stage. Producers can use the iO Dock for iPad music production, using its MIDI and USB-MIDI jacks to sequence external keyboards, samplers, drum machines and synthesizers, or perform using the iO Dock as the sound module connected to their MIDI keyboard, drum pad or other controller. An assignable 1/4-inch footswitch input enables remote control of an app-defined function such as stop/start or record. Users can also connect the iO Dock to their Mac or PC using the USB port to remote-control software with faders, transport controls or another MIDI-compliant control app. Musicians can connect the iO Dock’s stereo pair of 1/4-inch main outputs to studio monitors, or to PA systems for use in performance settings. They can monitor on headphones, and independently control the levels of the main and headphone outputs, each on its own knob. Recording musicians will use the iO Dock’s direct-monitor switch, which is designed to enable them to toggle between the incoming and playback signal on their headphones. Rounding out the iO Dock’s output section is a composite video connector, enabling users to employ the iO Dock as a source for video projection behind bands on stage, or for connection to most televisions and computer monitors. The Alesis iO Dock is now available from musical instrument and pro audio retailers everywhere with an MSRP of $399.00 and an estimated street price of $199.00. For more information, visit the Alesis website. ART USB Dual Tube Pre ART releases a two-channel tube preamp that is also a USB audio interface. Zero-G Electro Glitch Essentials Electro Glitch Essentials is described as "a roller-coaster ride of bass, beats, beds, cuts, hits, noises, fx, loops, impulse responses, wipes and swells for dance producers." Modartt Summer Promotional Offer for Pianoteq Modartt has announced a Summer promotional offer for its Pianoteq products.